Abstract: This exclusive episode, the first of Season 3, was recorded at Kingvention on September 10, 2016. Kingvention is Europe’s biggest Michael Jackson Convention, which took place at Victoria, Central London, at the Victoria Suites of the Park Plaza Hotel. Karin and Elizabeth were exhibitors at Kingvention and recorded this live show with appearances from guests, Mike Smallcombe, Alana, a wonderful fan and twitter-follower at @MJAS29, and MJ Studies Online Course scholar, Nicole. They also discuss the third section of Elizabeth’s academic book, The Dangerous Philosophies of Michael Jackson: His Music, His Persona, and His Artistic Afterlife. The prizewinners of the Massive Kingvention Giveaway are announced at the end of this episode. Merx, Karin, and Elizabeth Amisu. 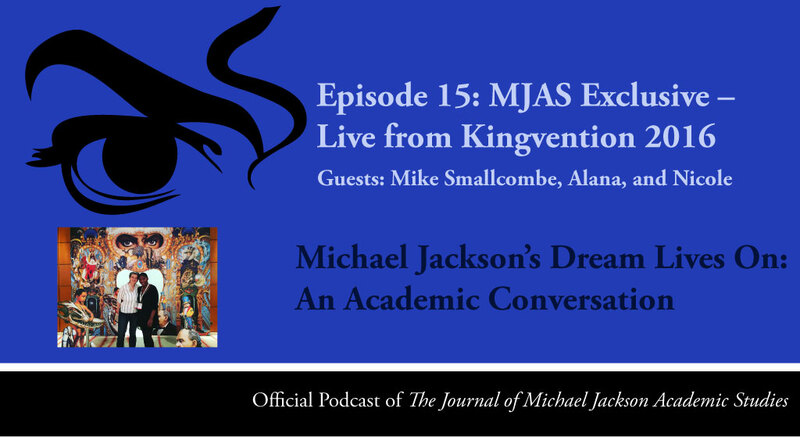 “Episode 15 – MJAS Exclusive: Live from Kingvention 2016.” Podcast, Michael Jackson’s Dream Lives On: An Academic Conversation 3, no. 1 (2016). Published electronically 13/9/16. http://michaeljacksonstudies.org/episode-15/. 1. Can you tell us about your day? 3. Do you have other books planned? 4. Why is your book suited to academics and people who want to study Michael Jackson? 5. Can you tell us about the cover and what it means to you? 6. How can our listeners get hold of a signed copy of your book? 2. When did you become a Michael Jackson fan? 3. What is your favourite album? 4. How does Michael Jackson resonate to you as a 15 year-old? Does he feel old or fresh? 5. How did you feel coming down here? 6. What has been your favourite part of coming to Kingvention? 7. Can you tell us a bit about your Moonwalker shirt? 8. How did you feel about entering the competition? 9. What would you do if you won? 10. How did you like the Moonwalker exhibition? 11. What would you say the energy is like at Kingvention? 1. Can you tell us a bit about the 3rd section of your book? 2. Can you explain the function of the editor? 3. You write a chapter on the latest work of an artist, can you explain this? 4. In what way was Michael Jackson connected to Andy Warhol? 1. Can you tell us where you come from? 2. Can you tell us about you studying Michael Jackson? Why are you doing that? 3. Can you tell us a bit about yourself as a classical musician? 4. What has been the highlight of your time at Kingvention? 1. 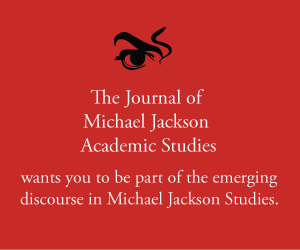 Elizabeth Amisu, “Academic Book Review of ‘Making Michael: Inside the Career of Michael Jackson’ by Mike Smallcombe“, The Journal of Michael Jackson Academic Studies 2, no. 4 (2016). http://michaeljacksonstudies.org/academic-book-review-of-making-michael-inside-the-career-of-michael-jackson-by-mike-smallcombe/. 2. For a signed copy of Making Michael: Inside the Career of Michael Jackson by Mike Smallcombe go to his official site, makingmichael.co.uk. 4. Other Kingvention pictures by Karin and Elizabeth and the official Kingvention page. 7. Preview of The Dangerous Philosophies of Michael Jackson: His Music, His Persona, and His Artistic Afterlife at Amazon.